Background: The biotransformation of xenobiotics is a homeostatic defensive response of the body against bioactive invaders. Xenobiotic metabolizing enzymes, important for the metabolism, elimination and detoxification of exogenous agents, are found in most tissues and organs and are distinguished into phase I and phase II enzymes, as well as phase III transporters. The cytochrome P450 superfamily of enzymes plays a major role in the biotransformation of most xenobiotics as well as in the metabolism of important endogenous substrates such as steroids and fatty acids. The activity and the potential toxicity of numerous drugs are strongly influenced by their biotransformation, mainly accomplished by the cytochrome P450 enzymes, one of the most versatile enzyme systems. Objective: In this review, considering the importance of drug metabolising enzymes in health and disease, some of our previous research results are presented, which, combined with newer findings, may assist in the elucidation of xenobiotic metabolism and in the development of more efficient drugs. 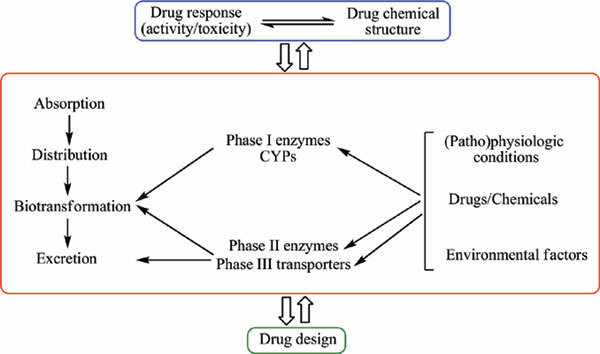 Conclusion: Study of drug metabolism is of major importance for the development of drugs and provides insight into the control of human health. This review is an effort towards this direction and may find useful applications in related medical interventions or help in the development of more efficient drugs. Keywords: Xenobiotic metabolism phase I II III, Cytochrome P450, Drug interactions, Drug design, Drug metabolising enzyme induction inhibition, Drug metabolism and pathologic conditions. Keywords:Xenobiotic metabolism phase I II III, Cytochrome P450, Drug interactions, Drug design, Drug metabolising enzyme induction inhibition, Drug metabolism and pathologic conditions.